BOTOX® or DYSPORT® are the treatments of choice for the dynamic wrinkles, the movement-related lines and grooves in your face. Importantly, by relaxing specific muscles of facial expression Dr Olson shapes the face for a more attractive balanced expression. 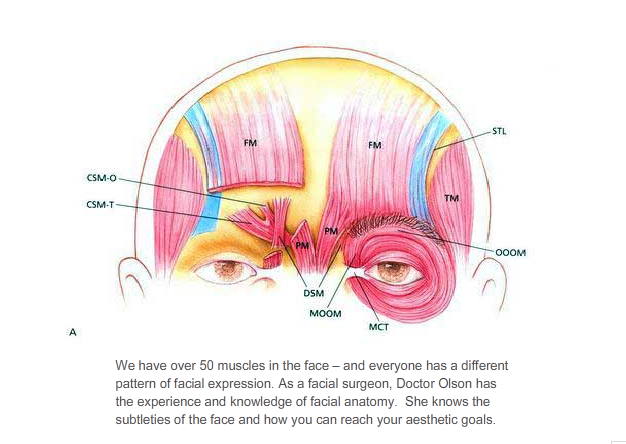 As a facial surgeon, Doctor Olson has the experience and knowledge of facial anatomy. She knows the subtleties of the face and how you can reach your aesthetic goals. Doctor Olson likes to use BOTOX to control the eyebrow position and contour by relaxing the eyebrows apart and upward – a “BOTOX Browlift” and shaping. Dermal fillers like JUVEDERM® can be used to complement the effects of BOTOX so it is longer lasting. A tiny amount of BOTOX precisely injected, relaxes specific muscles and allows the body’s own collagen to regenerate in those lines formed from repetitive movement. BOTOX can be used artfully to have a subtle softening effect that is neither obvious nor takes away our ability to communicate. Importantly, BOTOX can be used to shape the face by the advanced balanced injection to muscles of facial expression. Seek “before and after photos” how asymmetry of the face can be balanced. Even subtle changes can be made in droopy eyelids and a “gummy smile”. BOTOX and DYSPORT should be injected by the most experienced specialist in a medical setting to achieve a safe, natural and finessed result. Each lasts for 3 to 4 months. Doctor Olson will help you decide which is right for you. Call for a consultation now and take advantage of our VIP card available only to our patients. We have over 50 muscles in the face – and everyone has a different pattern of facial expression. In time, wrinkles in the skin form even when we are not moving, and become like caricature lines. Sometimes they communicate anger or sadness, even when we are NOT feeling those emotions. Expert treatment to relax specific muscles results in a subliminal difference.